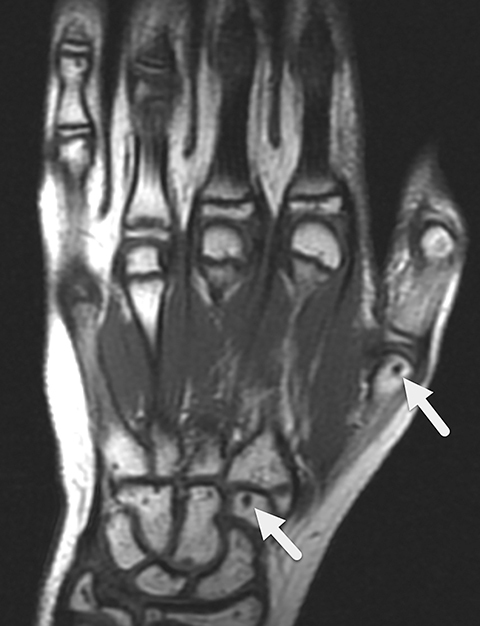 An 11-year-old girl with a medical history of eczema and myopia presented for imaging with a primary complaint of right hand pain and hypothenar swelling. The patient stated that she did not have any recent trauma to her hand. 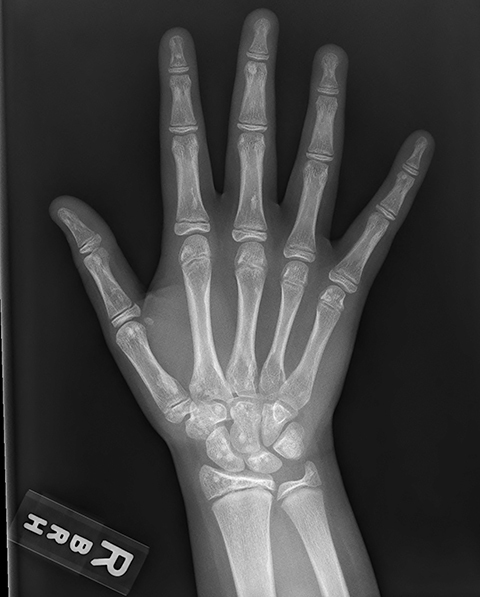 Radiography of the right hand demonstrated multiple, small sclerotic lesions distributed throughout the bones of the right hand. These lesions were concentrated in the carpal bones, the metacarpals and the phalanges as well as in the epiphysis of the radius and ulna. Follow-up MRI revealed similar lesions that were dark on T1- and T2-weighted images. 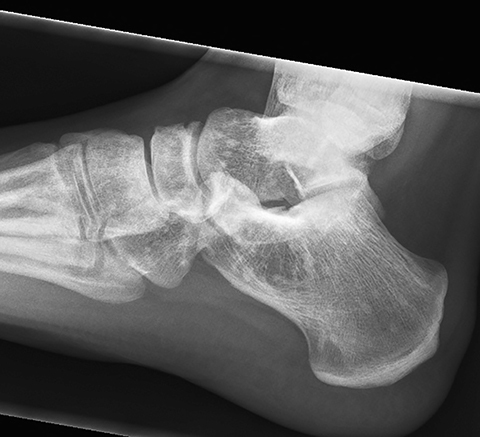 A radiograph of the right ankle was obtained two years later and showed numerous round and oval small sclerotic foci throughout the visualized bones, like those seen on the prior hand radiograph. Subsequent radiographs of the left knee (performed five years after the original diagnosis) and chest (performed seven years after the original diagnosis) showed innumerable tiny sclerotic foci throughout many of the imaged bones. However, the vertebral bodies and ribs were not noted to have any lesions. >Osteopoikilosis. The differential diagnosis includes osteoblastic bone metastasis, tuberous sclerosis, mastocytosis, melorheostosis, and osteopathia striata. Osteopoikilosis is typically discovered late in childhood or puberty and most of the time persists for the remainder of a patient’s life. Patients are usually asymptomatic at initial presentation and have an unremarkable clinical exam. However, studies have found that in 15-20% of cases patients have mild joint pain and even joint effusions; whether these symptoms are secondary to the actual disease process or prior injury is not yet understood. On MRI, these lesions are small and dark on both T1- and T2-weighted images, as they are composed of dense cortical bone.5 In order to distinguish between osteopoikilosis and osteoblastic metastasis, skeletal scintigraphy with technetium-99m is occasionally performed. While osteopoikilotic lesions normally do not demonstrate any uptake of radiotracer, osteoblastic metastasis produce “hot spots” on bone scans.5 However, given the typical imaging appearance of this disorder, no additional imaging is typically required unless the patient has a known primary tumor. Osteopoikilosis is a rare bone disorder diagnosed at imaging. 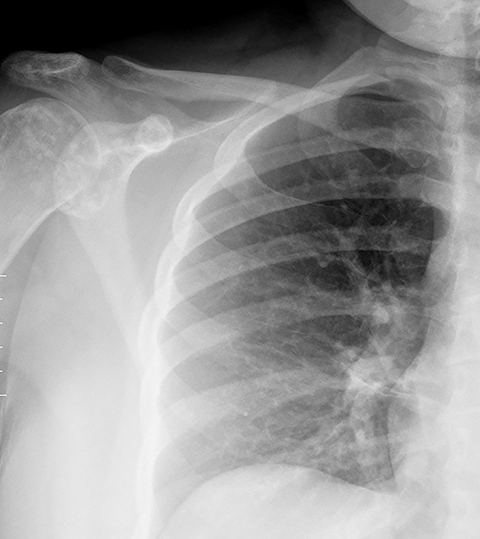 Because of its characteristic imaging appearance, it is considered a skeletal “don’t touch” lesion. In certain patients with a known osteoblastic tumor, it may be difficult to differentiate osteopoikilosis from osteoblastic metastasis. Boulet C, Madani H, Lenchik L, et al. Sclerosing bone dysplasias: genetic, clinical and radiology update of hereditary and non-hereditary disorders. Br J Radiol. 2016;89(1062):20150349. Drouin CA, Grenon H. The association of Busckhe-Ollendorf syndrome and nail-patella syndrome. J Am Acad Dermatol. 2002; 46:621–625. Hellemans J, Preobrazhenska O, Willaert A, et al. Loss-of-function mutations in LEMD3 result in osteopoikilosis, Buschke-Ollendorff syndrome and melorheostosis. Nat Genet. 2004;36(11):1213-1218. Borman P, Ozoran K, Aydoğ S, Coşkun S. Osteopoikilosis: report of a clinical case and review of the literature. Joint Bone Spine. 2002;69(2):230-233. Gaillard, Frank. “Osteopoikilosis.” Radiopaedia.org, Apr. 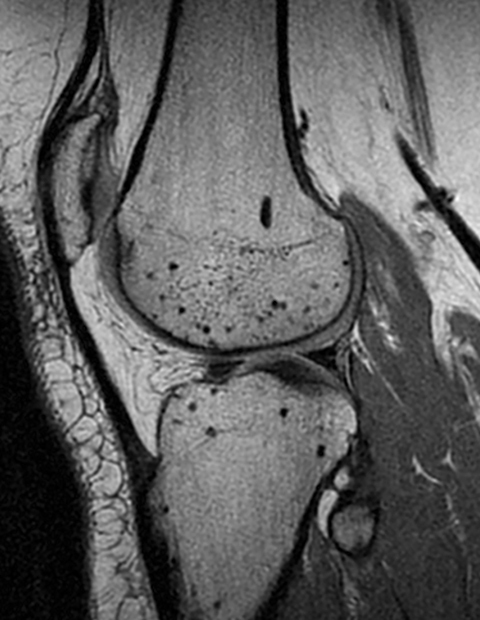 2017, radiopaedia.org/articles/osteopoikilosis-2. Boronat S, Barber I, Thiele EA. Sclerotic bone lesions in tuberous sclerosis complex: A genotype-phenotype study. Am J Med Genet A. 2017 May 9. doi: 10.1002/ajmg.a.38260. [Epub ahead of print]. Hellemans J, Debeer P, Wright M, et al. Germline LEMD3 mutations are rare in sporadic patients with isolated melorheostosis. Hum Mutat. 2006;27(3):290. 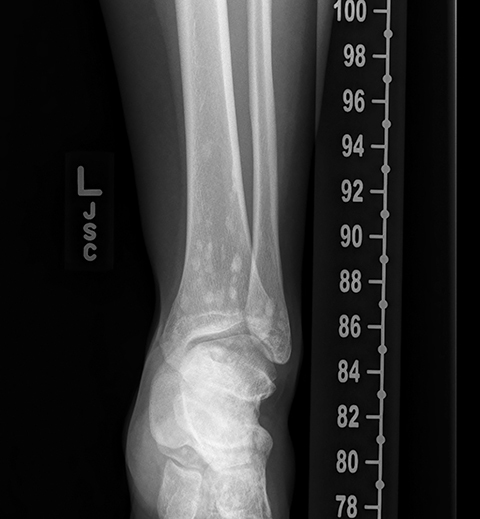 Carpintero P, Abad JA, Serrano P, Serrano JA, Rodríguez P, Castro L. Clinical features of ten cases of osteopoikilosis. Clin Rheumatol. 2004;23(6):505-508. Mahbouba J, Mondher G, Amira M, Walid M, Naceur B. Osteopoikilosis: A rare cause of bone pain. Caspian J Intern Med. 2015;6(3):177-179. Wallace S, Towbin RB, Towbin AJ. 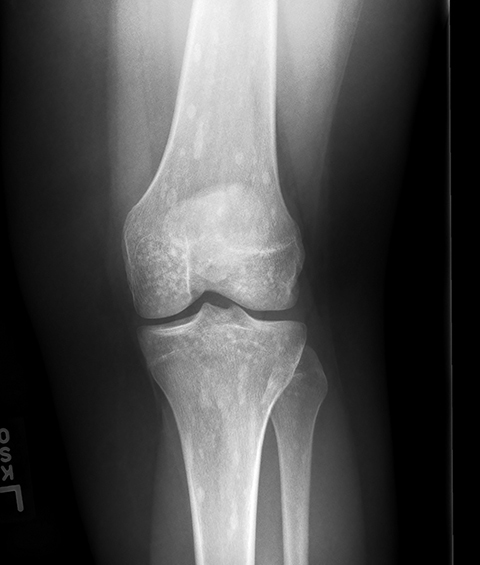 Osteopoikilosis. Appl Radiol. 2019;48(2):40-41. Prepared by Dr. Wallace while a Radiology Resident at the University of Pittsburgh Medical Center; Dr. Richard Towbin while a Pediatric Radiologist at Phoenix Children’s Hospital, Phoenix, AZ; and Dr. Alexander Towbin while a Pediatric Radiologist at Cincinnati Children’s Hospital Medical Center, University of Cincinnati College of Medicine, Cincinnati, OH.